This is a detailed itinerary for 24-hours in Frankfurt if you happen to have a layover or are stopping on your way through. The best things to do in Frankfurt including traditional restaurants in Frankfurt and transport information. Information on all the best places to visit in Northern Cyprus. Includes information about accommodation and car rental so you can discover all the best things to in Northern Cyprus. All the best places to see on your journey through the Baltics (Lithuania, Latvia, Estonia). Top places for your Baltics itinerary as well as tips and advice for driving in the Baltics. Finding the best bookshops in Edinburgh is at least a full day's job. This article is for all book-lovers heading to Edinburgh and wanting so explore some of the beautiful, unique and over-flowing bookstores in Edinburgh. A list of all the best day trips from Frankfurt, Germany. Interesting and beautiful places near Frankfurt that you can explore in a day with a car or public transport. A complete guide to the best things to do in Nicosia. Covers all the attractions and quirky sights in both North and South Nicosia so you can explore all the top things to see in Nicosia in 2 days. When you're used to Christmas in New Zealand, acclimatising to spending Christmas in the middle of winter is tough. However, having the Christmas markets down the road makes it a little more bearable. Originally a German thing, they have now spread across Europe and many people come from other continents just to experience this magical Christmas tradition. As a result of their popularity the Christmas markets are almost always crowded and can be very overwhelming if you’re visiting just one and want to try everything. So I’ve made a list! Here are my favourite things to try at the Christmas markets and some tips for finding the top spots. 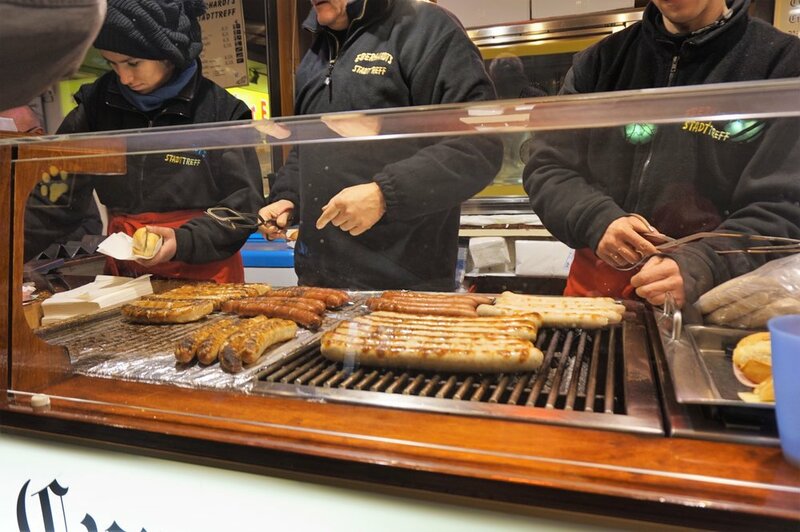 What German experience would be complete without a sausage or two? Every German Christmas market will offer a wide selection of sausages usually including a local specialty. They are almost always served in a crusty bread roll (brötchen). Look around for the mustard pump, if you’re lucky it will be an udder-like squeezy bottle hanging from the roof! I’m not really a hot drinks person at the best of times so hot alcohol really isn’t my thing. But this year I made it my mission to find a Christmas market beverage that I enjoyed. 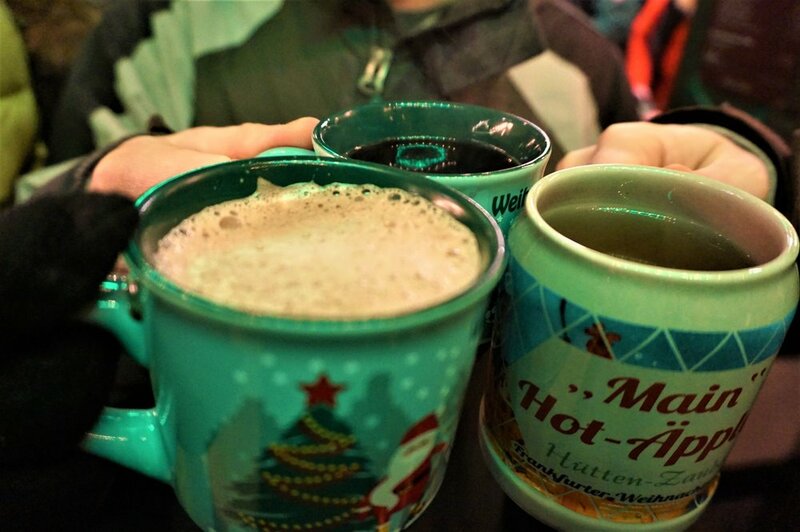 There are plenty of Glühwein (mulled wine) options including red, white and rose and even options for shots to be added. Here in Frankfurt the local drink is apple wine which they serve hot at the markets. My pick though is a hot chocolate with a shot of brandy and cream. Mmmmmmm! You’ll be able to locate the nut stalls by their sweet smells wafting through the market. There are huge varieties covered in various flavoured coatings. Roasted chesnuts are a real winter thing here and there are often big ovens roasting the nuts while you wait. This is the German version of gingerbread and anyone who has been to Oktoberfest will be familiar with them. Usually heart-shaped biscuits with piped icing to decorate and write some kind of message. They come on strings to hang around your neck. I’m not such a fan of the actual biscuit but love the look of them all hanging in the lit up stalls. So German! For my fellow kiwis these are somewhat comparable to a Mallowpuff. Delicious flavoured marshmallow filling on a waffle base, cased in chocolate. The marshmallow is lighter and creamier than normal and comes in the most amazing variety of flavours such as coconut, Baileys and mocha. A real melt in the mouth treat and at only 70c a pop you can try a few flavours! You will find these things at almost every Christmas market in Germany. It can be very difficult choosing which Christmas markets to visit and when to go. Big city ones will be busy. For a quieter experience head to small towns. These can be just as nice and much more relaxed and authentic. For big ones try Nuremberg, Cologne, Frankfurt or Dresden. Smaller ones are in every town. Around Frankfurt I can recommend Wiesbaden, Darmstadt or Mainz. Pace yourself if you're going to more than one. They do all get the same after a while so choose a couple of things to try at each. Every market has local specialties and different souvenirs so look out for something different. Take the cups. If you're looking for something to remember the markets you can take home the glühwein cups which have a special design for every market every year (you pay a €2-3 deposit when you buy a drink). Go during the day to shop as its much quieter and then go back at night to enjoy the atmosphere and drinks. Christmas markets will never quite replace barbecues in the sun in the lead up to Christmas but they sure make the cold more tolerable and bring a bit of Christmas magic to almost every town in Germany. 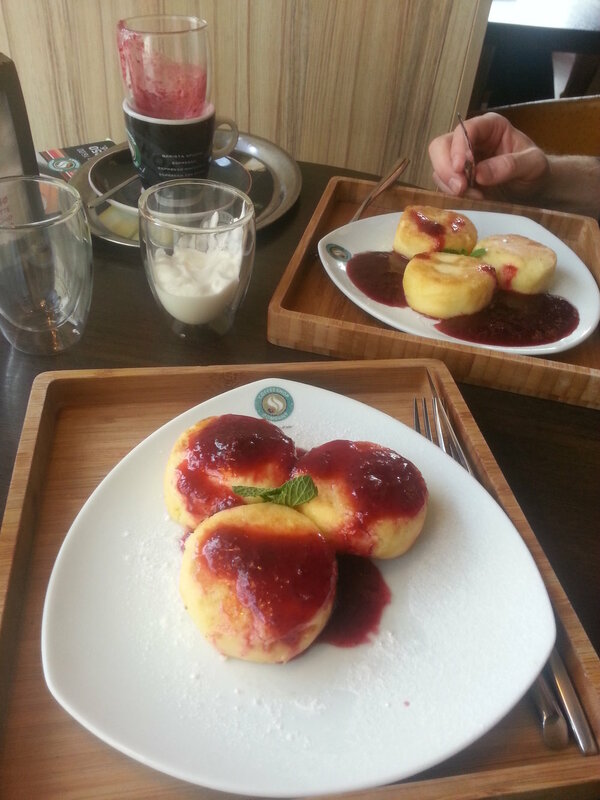 Looking for more German food experiences? Here's some things to do in Munich. For some unknown reason we sat and talked our way through the boarding and closing of our flight. After pleading with the staff and being given a resounding 'no' we sat and came to terms with our dilemma. Either we could pay over €100 each for a new flight in two days time or find another way home. Buses and trains were extremely long and expensive so we opted for the cheapest way we could think of: hitchhiking. Neither of us had really hitchhiked before and didn't know a lot about it but after some reading up, route planning and sign making we were ready to hit the road! We weren't expecting to get very far but set our sights on London where we could easily find another way home. But we were so overwhelmed by the generosity and friendliness of British drivers that we continued our adventure across the channel and into Europe. Highlight: Hitchhiking out of the centre of London because we didn't want to pay the ridiculous public transport prices. Lowlight: Being dropped in a small Dutch town after dark and having to find affordable accommodation for the night. Everyone we rode with, from a friendly Scottish salesman to family of Iranian women who spoke no English, was just a kind person heading in the same direction. One man drove us from Belgium to Germany because it was his day off and he had some spare time! At no point did we feel threatened or in danger. We never needed to wait long and managed to visit some friends along the way as well as making new ones. Definitely a mode of transport I would use again! Travel in twos. This is a basic safety tip but also makes you seem more sociable and approachable to potential rides. Travel light. It much easier to fit in a car or jump in quickly if you only have small bags. Lots of people will drive past if you have lots of gear as they can't be bothered with the hassle of packing the car. Have a sign. We held up a sign with the name of the next town or just the direction we were heading. This got drivers attention and meant they knew straight away if they could help or not. Stand in a logical place. Stand so drivers have enough time to see you, read your sign and pull over. Standing near a corner or where there is no possibility to pull in will mean you won't get anywhere far! Have a map. Obviously not a literal one but at least an app you can rely on if someone drops you in the middle of nowhere and you need to see how far it is to the next town. Be flexible. The great thing about our trip was that we were in no hurry to get home so were happy to travel in short bursts. Because of the nature of hitchhiking you can never plan how long it will take or how far you'll get each day so be open! Pack snacks. You never know when you'll be standing with your thumb out for 2 hours and get hangry at each other! Try reading up on hitchwiki about the place you're hitching from. Enjoy the ride. Make the most of getting to chat to some new and interesting people. And don't forget to be grateful. Note: Crossing from France to England is best done with the ferry as cars pay per vehicle rather than per person. We were picked up at the petrol station before the ferry terminal and got onboard without any issues. Europe is one of the most amazing places to travel. The variety of languages, cultures, history and food all squeezed into one, easy to navigate landmass make it the perfect place to backpack around or live for a while and explore through weekend getaways. The only drawback is the cost. Europe is by no means a budget backpackers paradise but there are many ways to cut costs and still enjoy everything this amazing continent has to offer. The major and unavoidable costs on any trip are transport, food and accommodation. 'Heading East' and 'travelling Europe in the off season' are great ways to cut the costs of any trip. But if you have to go to Europe in the summer there are still ways to save money. So here's a breakdown of some ways to travel Europe on a budget. From saving a few euros here and there to doing it on an extreme budget. It is possible to travel europe on a budget. Ways of travelling europe on a budget. Europe on a budget travel tips. Hitchhiking in Europe is the ultimate free way to get around. In most countries it is accepted and relatively easy to get a ride. Make sure you're at a point that is easy to pull over and carry some cardboard to make signs for your direction or next destination. Make sure to look clean and friendly and you'll have no problems travelling between cities for free. The amount of traffic in Europe means there are almost always people going your way. We even hitchhiked out of London city centre! Hitchhiking in Europe is a big part of staying in your budget when travelling Europe on a budget. If hitchhiking sounds a bit adventurous or you're on a tight time frame try ride sharing. Blablacar is a ridesharing website that covers most of Europe. From there you can search people driving to your destination and sometimes even book straight away. There is a cost listed which is usually very reasonable and often cheaper than trains or buses. Rome2rio is another great website for searching cheap travel methods. Simply type in your location and destination and it will tell you all the ways of getting there with a rough price. For a full list of tips and hacks check out our ultimate guide to finding budget accommodation. Look up hostels on a search site like hostelworld but then go to the actual hostel website to book as they often bump up prices to cover hostelworld fees. Take a tent to save money on your Europe on a budget trip! If you're travelling in summer, take a tent. Free camping is legal in the Baltics, Scandinavia and parts of Eastern Europe (check out our favourite free camping spots in Albania). There are a vast network of affordable campsites across the rest of Europe. Also check out campsites with permanent tents like the one I stayed at on the outskirts of Rome. Way cheaper than staying in the centre, had a bar and swimming pool and was an easy train ride into town. 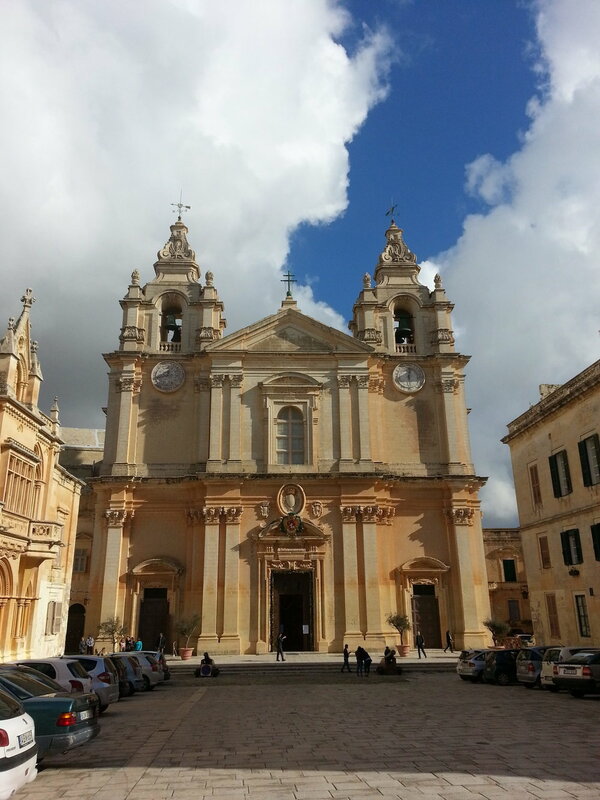 For more Italy inspiration check out this awesome guide to planning an Italy itinerary! Airbnb is a great option for couples or groups of friends and allows you to search on a map and limit searches by price and type of room. Everything from people's couches to entire apartments. Be careful to read reviews and check the price once the fees (cleaning and service fees) have been added. Click here for €20 off your first booking! Even better than that is the amazing couchsurfing network. You create a profile, add some photos and then you can start requesting to stay at people's houses. Anything from a mat on the floor to your own room, these friendly people will host you for a night or a week depending on their availability. It works on a karma basis so if you stay with people, try to host some travellers when you're back home. There are people who are also free to show you around their city or meet up for a drink. Great for solo travellers or people wanting to meet locals. We have had nothing but positive experiences both as surfers and hosts. In general try to give 5-10days notice, if you're staying a few days offer to cook or bring a bottle of wine and be open-minded and considerate. You'll meet some great people! On the road for a while? Why not invest in a van and pay no accommodation costs for your entire trip? We are currently living in ours and travelling through the Balkans. Here's a list of vanlife essentials to get you ready for life on the road. Vanlife is a huge money saver on a budget trip in Europe! Travelling Europe on a budget. A habit Max and I get into while we're travelling is to only eat 2 meals a day. We often have some fruit or muesli bars as a quick morning snack but we don't eat a proper meal until 11-12ish which then keeps us going until dinner. Many hostels in Europe offer free breakfast so take advantage! Fill up and, if your feeling extra thrifty, make some sandwiches and take some fruit for a packed lunch. A picnic saves you a lot of money to save on your Europe budget trip. Hostels and Airbnbs also often have a kitchen available for use. If you're staying in one place for a few days consider heading to a supermarket and cooking some simple pasta or rice dishes to save some money. Team up with some other travellers to buy in bulk. Friends of mine did this in Bosnia and Herzegovina and averaged about 50c per person for a decent meal. If the weather is decent then make use of the abundant bakeries in Europe for a cheap picnic lunch in the park or square. Take a free walking tour. Just about every city offers these now and they can be very good value. Your tour guide, usually a student, takes you on a tour of up to 3 hours around the city giving you interesting information and answering questions as you go. At the end you tip what you want, usually it's worth a few euro but if you're on a real budget you can slip away without paying. Some cities have more than just the classic attractions tour too. We went on a great 'alternative Warsaw' tour and have heard of food and street art tours in other cities. Check for free days at attractions. Many museums and sites have one day per month that they are free e.g first Sunday of the month. This can save a lot of money if you plan it right but also be aware that these days can be crazily busy. Get a student ID. If you're a student, go to STA travel and get an international student ID which will give you discounts at a huge range of tourist attractions. If you're not a student but are under 25 ask for their youth card which often gets you the same discounts, either because you're young or because they mistake it for a student card. They also have teacher cards available. See the beautiful architecture in Europe on a budget! Europe on a budget is easy to do and you can still have the experience of a life time. Got any other tips or experiences for saving money on travel in Europe? Let us know in the comments below. A guide to travel options for solo travel in Europe. From package tours in Europe to traveling independently around Europe. All the pros and cons so you can make a decision for your solo Europe trip. A guide to getting a visa for Russia. Includes information about the application, getting an invitation letter to Russia and registering once you get there. Russia was one the places I enjoyed the most this year. We went without many expectations and were pleasantly surprised at every turn by this incredible country. Also read our practical information about visas. Almost everywhere you look in Russia there are buildings on a grand scale, beautifully designed and often unused. Of course there are the well-known ones such as St Basil’s Cathedral, The Kremlin and the Winter Palace which are all spectacular. But walking around the cities you will constantly come across incredible buildings and monuments that may look like they could house a king but are of very little significance. For some interesting buildings head to the parks surrounding the Space Museum in Moscow, the Izmailovsky market or the Moskovsky district of St Petersburg. And the best part about it is buildings are almost always free to look at! 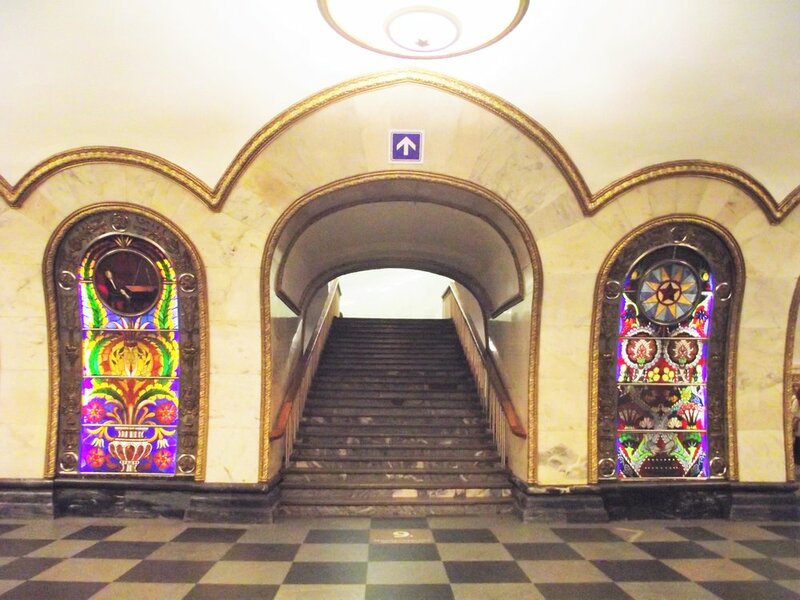 Worth a day trip in itself the Moscow Metro is extremely efficient, cheap, always busy and spectacular to look at. Every station is designed like the entrance to a museum or the lobby of grand hotel. From stunning mosaics and stained glass windows to Lenin monuments and rows of statues, there is something different to see at every stop. We spent an enjoyable day hopping between stations and being wowed by each one. A ticket for the metro costs about 50c and if you don’t go out of the station you can ride around all day on one ticket. This makes for a pretty affordable day out and a very different activity to most other cities. Having heard Russia was reasonably expensive we were pleasantly surprised with how much we were able to stick to a budget. Our top savings were on transport and accommodation. As mentioned before the metro is only 50c and with huge distances between stations you will need to use it. We booked our accommodation through booking.com and paid less than €20 a night for a private double in a basic but clean hostel-style place with easy transport access to Moscow city centre. We also couch-surfed for a few nights which saved some money and our hosts showed us some less touristed parts of St Petersburg. Food could be found for very decent prices and often the chains provided cheap, authentic Russian food. We loved the buffet on the top floor of the G.U.M shopping centre. We also took a free walking tour which was a great way to get to know the city! One of our biggest expenses was the visa which you can read about here. 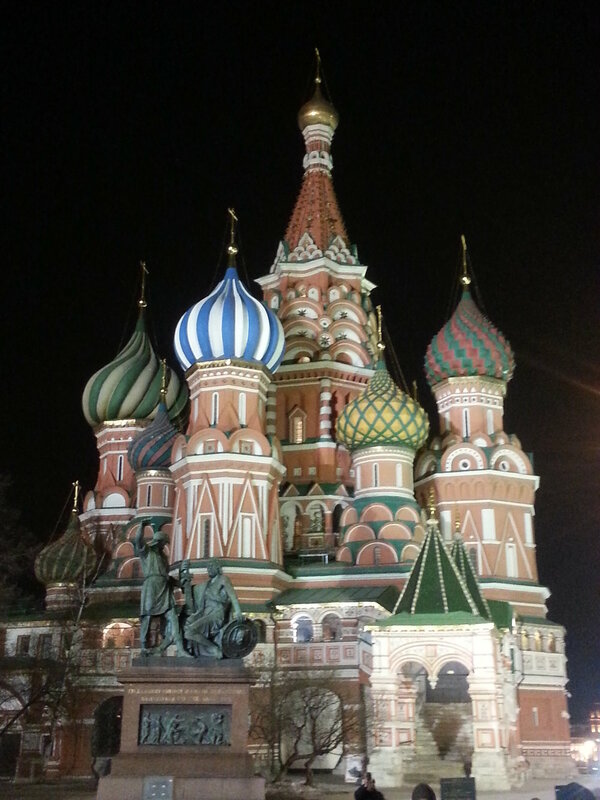 Something I particularly enjoyed about Russia was the way it felt both familiar and foreign at the same time. Moscow had the safety and convenience of a modern European city. However, hardly anyone spoke English and all the signs (including the Metro) and menus were all in Russian which made it feel much more adventurous and exciting. The cities looked very different to what you would see elsewhere in Europe but it was always easy to find shops and restaurants. The people were very friendly and despite it being winter there were lots of people out and about. I didn’t know a lot about Russian culture before going there so really enjoyed staying with some local people and getting a feel for this immense and interesting country. Yes, I’m putting a major tourist attraction on my list and trust me, I was hesitant about even going there but all the reviews raved about it and it was one of my parents’ highlights of their Russian trip 27 years ago. And boy am I glad we went! We chose to go a bit later on a Wednesday as it is open until 9pm and it is supposedly a bit quieter. We went at 5pm expecting to be out an hour or so later, not being big museum people. But we rolled out with the last visitors at closing time feeling utterly awestruck and exhausted. This incredible museum is one of the world’s oldest and largest. Housed in a stunning building known as ‘The Winter Palace’ we were often more amazed by the rooms things were kept in than the things themselves. The museum houses everything from fossils and mummies to the largest collection of paintings in the world. Go on the first Thursday of the month for free entrance!